No.2-seed Denver (20-10-5) hosts No. 9-seed Alaska Anchorage (14-15-5) in the first round of the WCHA Playoffs on March 13-15. Puck drop is set for 7:37 p.m. on Friday, March 13 and 7:07 p.m. on Saturday in the best two-of-three series. Puck drop for Sunday's game, if necessary, is set for 7:07 p.m. Jay Stickney will have the call on AM 1510 on Friday and AM 560 on Saturday and Sunday. All games will be webcast on Pioneer Vision on www.DenverPioneers.com. The Pioneers own a 37-14-5 all-time advantage against Alaska Anchorage in the series that started in 1992-93. The Pioneers are 20-7-1 against the Seawolves in Denver, including a 12-4 mark at Magness Arena. DU is 9-1 in its last 10 games against UAA and 12-3 in its last 15. DU has held UAA to three goals or less in the last 12 of the last 13 contests. The Pioneers are 3-2 in their last five games against UAA, including a split in February at Magness. The Seawolves bring a four-game winning sweep to Denver after sweeping Alaska (1-0, 3-0) and Minnesota Duluth (5-4, 4-2). And the hottest UAA player is Kevin Clark, who earned WCHA Player of the Week honors last weekend, A 5-9, 167-pound right winger from Winnipeg, Manitoba, Clark scored four goals in the UMD series and added two assists for six points as the visiting Seawolves swept on the road for the first time since Nov. 10-11, 2000 (@ Wisconsin) and extended their winning streak to four games - a feat that hasn't been accomplished in over a decade (Dec. 4, 1998-Jan. 8, 1999). Last Friday (March 6) at the Duluth Entertainment & Convention Center, Clark led the UAA attack with a two-goal, two-assist night in a 5-4 victory over the host Bulldogs. He scored the game-opening goal in the first period, tied the score at 3-3 with a goal in the second, and then set up both of his team's goals in the third period - including teammate Josh Lunden's winner. Last Saturday (March 7) evening, Clark came back with a two-goal night to lead Alaska Anchorage to a 4-3 win over UMD. In addition to his six points in the series, he also fired 10 shots on goal and earned a +3 plus/minus rating. On the 2008-09 season, Clark ranks second on the UAA team in scoring with 29 points in 32 games (11g,18a). The Seawolves are also led by forwards Paul Crowder, Tommy Grant and Josh Lunden, who scored 14 goals each. Mat Robinson (2-12--14) and Curtis Leinweber (2-10--12) anchor UAA’s blueline, while Bryce Christianson (8-7-4, 2.53 GAA, .895 Sv%) and Jon Althuis (6-8-1, 3.45 GAA, .875 Sv%) share the goaltending duties. Christenson posted both shutouts against Alaska on Feb. 27-28. University of Alaska Anchorage is the largest member of the University of Alaska System, with more than 19,000 students, about 14,000 of whom attend classes at the main Anchorage campus. Most of the students at UAA commute, while about 1000 students live on campus. UAA comprises eight colleges and schools: The College of Education, College of Health and Social Welfare, College of Arts and Sciences, College of Business and Public Policy, the Community and Technical College, School of Engineering, School of Nursing and School of Social Work. There are four community campuses: Matanuska-Susitna College, Kenai Peninsula College, Kodiak College, and Prince William Sound Community College. UAA offers Graduate degrees through the Graduate Division. The university's history began in 1954, when the Anchorage Community College opened, using the then-Anchorage High School building at night. 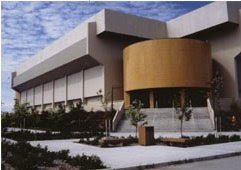 Anchorage Senior College began providing upper-division classes in 1969, becoming the four-year University of Alaska Anchorage in 1976. UAA, ACC, and ACC's rural extension units merged in 1987 to form the present institution. Located in the heart of Alaska’s largest city is the University of Alaska Anchorage, the state’s largest post-secondary institution. The campus is nestled in the middle of a greenbelt, surrounded by lakes, ponds and wildlife, and is connected to a city-wide trail system. UAA is a program that represents the underdog in all of us. They play home games that are at least two time zones and long plane flights removed from most of the rest of college hockey, and since few visiting fans have made the trip to Alaska in winter, we know less about UAA, contributing to their unique mystique. UAA began playing varsity hockey in 1979, under pioneering coach Kelvin “Brush” Christiansen. As a startup program in the first season, UAA’s team did not leave the state of Alaska, as the team played at 8 games at the NCAA D-II level against fellow Alaskan rival the University of Alaska Fairbanks, beating UAF in all 8 games, and the remaining 23 games against Alaskan Senior League teams, going 17-14 overall. The first four seasons of UAA hockey would be played on campus at the UAA sports center, now known as the Wells Fargo Sports Complex, where UAA won 70% of its games. UAA now uses the rink as a practice facility. The following season, UAA scheduled a full collegiate slate at the D-II level, and went 14-10. By 1981-82, the Seawolves began scheduling more Division I opponents, and gained their first sweep of a D-I school when they defeated the Northern Arizona Lumberjacks. That season also included a triumphant four game sweep of German opponents in the former West Germany. In 1982-83, The Seawolves recorded their first 20 win season, going 20-7-1, and were in the process of establishing themselves as a legitimate spectator attraction in Anchorage. For the last game of that season, UAA lost a 4-3 exhibition to US National Team in the newly-constructed 6,000-seat Sullivan Arena in downtown Anchorage, where they have played ever since. The 1983-1984 hockey season would be the last played at the Division II level, and the Seawolves made it a memorable one, winning 23 games, losing six and tying one and starting the season with a 22-game winning streak (with five of the 22 wins coming against the Korean National Team) and their first win over a WCHA school, a 8-3 whipping of Colorado College. The next year, UAA elevated the program to play as a full NCAA Division I independent, and went 17-21, including a six-game sweep of Korean Universities in South Korea. The next big step in the evolution of the program was the formation of the Great West Hockey Conference in 1986, a collection of four former western independent programs (Northern Arizona, U.S. International University, UAF and UAA). While the conference lasted only a couple of seasons, UAA won the inaugural season and finished third in the second season. By 1989, NAU and USIU has dropped hockey as a varsity sport, and UAA found itself as a D-I independent once again. Fortunately, 1989-90 was the breakthrough season for the program as a legitimate D-I force. The team went 21-11-2, with a lot of magic moments along the way. The first sweep of a Hockey East team came in January, when UAA swept Maine. But the biggest regular season moment of all came when UAA beat Minnesota in Minneapolis, 4-3 in a thrilling overtime contest, announcing to the world of college hockey that the UAA program was for real. The next week, UAA also tied Michigan in Ann Arbor and finished out the regular season of college opponents with a 5-1 drubbing of rival UAF. In those days, the NCAA tourney was a 12-team tournament, and UAA was selected to represent the lone independents’ slot after beating Notre Dame in the special independents’ tournament in Alabama. While UAA lost to Lake Superior State in the first round of the NCAAs in a two-game total-goals series, it marked another step in the development of the program as the first of three consecutive years of NCAA appearances as an independent. This three-year era represented the high water mark of the UAA program in terms of wins and NCAA appearances. In 1990-91, behind the superb goaltending of Paul Krake and the scoring talents of Robb Conn and Dean Larson, the Seawolves won 22, lost 17 and tied 4. But the story of the season was not so much in the beginning of the year, when UAA started with only two Division I wins before December, but the finish, when UAA hosted the independents’ tournament in March, and exploded for 15 goals, wiping out Alabama-Huntsville 5-0 and Notre Dame 10-2 to earn another independents’ slot in the NCAA tournament. The Seawolves would then face powerhouse Boston College in Chestnut Hill, Mass. on BC’s home ice– a tall order for any college hockey program, let alone an independent with only seven seasons as a D-I program under its belt. But UAA flew to Boston undaunted, and proceeded to shock the Eagles with a 3-2 victory in the first game, and doing it once again, beating BC in game 2 by a 3-1 count, marking the first NCAA victories for UAA, and sending the Seawolves to the NCAA quarterfinals as the victors of one of the bigger NCAA upsets in history. UAA then advanced to Marquette, Mich. to face the high-scoring Northern Michigan Wildcats, who would be the eventual NCAA Champions that year. UAA put up a good fight, but lost by 8-5 and 5-3 scores to NMU. The next season (1991-92) would become the most successful UAA season ever in terms of wins and losses, as the Seawolves stormed out a school record 27-8-1 record, and a 14-3 record heading into the New Year. In the second half, UAA went on another serious rampage through its independent schedule, going 13-2 from mid-January to early March, with the only two losses coming to arch-rival UAF in Fairbanks. The Seawolves then travelled back to Fairbanks for the Independents’ tournament, where they defeated Air Force 3-2 in the semifinal, setting up an epic revenge/grudge match with rival UAF for the independent tourney title and the NCAA bid. The game was tied 3-3 heading into overtime, and UAF fans were hopeful that fortune would shine on them at the Carlson Center. But it was not to be, as it was UAA who won the game in overtime, 4-3, sending the Seawolves to face Lake Superior State in a first round NCAA game at Joe Louis Arena in Detroit. Unfortunately for the Seawolves, a full 20 days had elapsed between the dramatic victory over UAF (March 7) and the game with LSSU (March 27), and LSSU won by a 7-3 count, ending UAA’s season. But all was not lost from a program standpoint, as the WCHA had noticed the advancement and commitment of UAA’s program. The WCHA awarded UAA with WCHA affiliate status for the next season, with an eye toward full WCHA membership in 1994. UAA’s admission to the WCHA would be a mixed blessing for the program – on one hand, the stability and security of playing in the nation’s dominant conference has improved the level of talent, credibility and prestige of the program, but due to the dramatically increased level of opposition that UAA now faces weekly in the WCHA, the Seawolves have not been able to finish higher than 6th in the WCHA since admission, have never hosted a league playoff game and still face some of the most difficult travel in all of college hockey every season. As a result, UAA has yet to make a return visit to the NCAA tournament. Brush Christiansen retired as coach after 17 years after the 1995 season, and he was followed by Dean Talafous for the next five seasons, followed by ex-UAA player John Hill for four seasons, before he suddenly left the team to be an assistant at Minnesota. Current UAA coach Dave Shyiak has been on the job for for the past 2.5 seasons.. The common denominator with all the Seawolf coaches since joining in the WCHA has been lower division finishes and mostly first round playoff exits. That’s not to say there haven’t been some thrilling moments in the last 15 years for UAA fans. 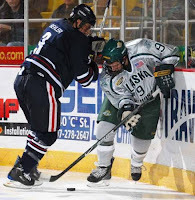 In the 2003-2004 season, UAA had a dreadful 4-14-1 second half of the season and finished 8th in the league. But in the league playoffs, UAA stunned Wisconsin at the Kohl Center in Madison, winning the best 2 of 3 series and advancing to the WCHA final five in Minneapolis for the first time ever. There, the Seawolves whipped Colorado College in the play-in game, 4-1, gaining a berth in the league semi-final, and coming only two wins away from an automatic NCAA tourney berth. But North Dakota ended the fairly-tale UAA finish with a 4-2 victory in the semis. Since then, there have also been some glimmers of hope in playoff play. In the 2005, WCHA playoffs, UAA also beat Wisconsin 2-1 again in Madison to even the playoff series at one game each, but UAA fell 2-1 in the deciding game three. And in 2007, UAA also enjoyed its only other WCHA first round playoff victory, over host Minnesota (2-1) in overtime to even the series at one game each, but the Gophers won deciding game 3-1 to advance. Individually, there have also been some well-known players to wear the Green and Gold, including future NHLers Robb Conn, All WCHA first teamer Greg Naumenko, Mike Peluso, Jeff Batters and Curtis Glencross. Through all the losing, the Seawolves have retained a loyal core group of fans, and still compete toe to toe with the local minor league hockey team, the Anchorage Aces, for local fans and publicity. A new on-campus arena is the hope for many UAA fans, but it is not yet a reality. UAA’s athletics teams were originally known as the Sourdoughs, but the university adopted the Seawolf moniker in 1977 when it elevated its program to the NCAA Division II level. The name ‘Seawolf’ represents a mythical sea creature that, according to Tlingit Indian legend, brings good luck to anyone fortunate enough to view it. The exact nature or shape of the Seawolf, however, is left to the imagination, thus the creature has been depicted in many forms throughout the years. The Seawolf logo of today was designed and introduced in 1985 by Clark Mishler & Associates in cooperation with a university committee. It represents an adaptation of a more traditional Alaska totemic-like characterization of the mythical Seawolf. Anchorage (officially called the Municipality of Anchorage) is Alaska’s largest city. With an estimated 279,671 municipal residents in 2007, and 359,180 residents within the Metropolitan Statistical Area, metro Anchorage constitutes more than 40 percent of the state's total population. On March 27, 1964, Anchorage was hit by the major Good Friday Earthquake, which killed 115 Alaskans and caused $1.8 billion in damage (2007 U.S. dollars). The earth-shaking event lasted nearly five minutes; most structures that failed remained intact the first few minutes, then failed with repeated flexing. Rebuilding dominated the city in the mid 1960s. In 1968, oil was discovered in Prudhoe Bay, and the resulting oil boom spurred further growth in Anchorage. In 1975, Anchorage merged with Eagle River, Girdwood, Glen Alps, and several other communities. The merger expanded the city, known officially as the Municipality of Anchorage. The city continued to grow in the 1980s, and capital projects and an aggressive beautification campaign took place. Anchorage is located in South Central Alaska. It lies slightly farther north than Oslo, Stockholm, Helsinki and St. Petersburg. It is northeast of the Alaska Peninsula, Kodiak Island, and Cook Inlet, due north of the Kenai Peninsula, northwest of Prince William Sound and Alaska Panhandle, and nearly due south of Mount McKinley/Denali. The city is on a strip of coastal lowland and extends up the lower alpine slopes of the Chugach Mountains. To the south is Turnagain Arm, a fjord that has some of the world's highest tides. Knik Arm, another tidal inlet, lies to the west and north. The Chugach Mountains on the east form a boundary to development, but not to the city limits, which encompass part of the wild alpine territory of Chugach State Park. Anchorage has a subarctic climate due to its short, cool summers. Average daytime summer temperatures range from approximately 55 to 78 degrees Fahrenheit (13 to 26 degrees Celsius); average daytime winter temperatures are about 5 to 30 degrees (-15 to -1 degrees Celsius). Anchorage has a frost-free growing season that averages slightly over 100 days. A diverse wildlife population exists in urban Anchorage and the surrounding area. Approximately 250 black bears and 60 grizzly bears live in the area. Bears are regularly sighted within the city. Moose are also a common sight. In the Anchorage Bowl, there is a summer population of approximately 250 moose, increasing to as many as 1000 during the winter and over 100 moose are killed by cars each year. Anchorage's largest economic sectors include transportation, military, local and federal government, tourism, and resource extraction. Large portions of the local economy depend on Anchorage's geographical location and surrounding natural resources. Anchorage's economy traditionally has seen steady growth, while not quite as rapid as the rest of the country; it also does not experience as much pain during economic downturns. Widespread housing foreclosures seen around the country during 2007 and 2008 were generally nowhere near as severe in Anchorage. The United States Military has two main bases in the area, Elmendorf Air Force Base and Fort Richardson as well as the Kulis Air National Guard Base in Anchorage. These three bases employ approximately 8500 people and military personal and their families comprise 10 percent of the local population. During the Cold War, Elmendorf became an increasingly important base due to its proximity to the Soviet Union. Since the September 11, 2001 attacks, Task Force 1-501 housed at Fort Richardson was upgraded into an airborne brigade to become the primary strategic response force in the Pacific Theater. While Juneau is the official state capital of Alaska, there are actually more state employees who reside in the Anchorage area including current Governor Sarah Palin. Around 6,800 state employees work in Anchorage, compared to around 3,800 in Juneau. Federal government workers also include around 10,000, many related to federal lands management. Many tourists are drawn to Alaska every year and Anchorage is commonly the first initial stop for most travelers. From Anchorage people can easily head south to popular fishing locations on the Kenai Peninsula or north to locations such as Denali National Park and Fairbanks. The economic impact of tourism and conventions in Anchorage totals around $150 million annually. The resource sector, mainly petroleum, is arguably Anchorage's most visible industry, with many high rises bearing the logos of large multinationals such as BP and ConocoPhillips. While field operations are centered on the Alaska North Slope and in more southern areas around Cook Inlet, the majority of offices and administration are found in Anchorage. Around one sixth of jobs state-wide are related to this industry. Sports-wise, The Sullivan Arena is not only home to UAA, but home to one professional hockey team the Alaska Aces of the ECHL. The city is also home to the Alaska Wild, an arena football team that began playing with the Intense Football League in April 2007. Anchorage's third professional franchise, which is scheduled to compete in the 2009-10 season, is the Alaska Dream, a basketball team in the ABA. UAA sponsors the annual Great Alaska Shootout, an annual NCAA Division I basketball tournament featuring colleges and universities from across the United States along with the UAA team. Anchorage holds the ceremonial start of the Iditarod Trail Sled Dog Race, and was the U.S. candidate for hosting the 1992 and 1994 Winter Olympics, but it lost to Albertville, France and Lillehammer, Norway respectively. In most sports leagues, a two seed like Denver vs. a nine seed like UAA is no contest. But the WCHA is no average league, and UAA happens to be playing its very best hockey of the season right now, winning its last four games, and showing that the Seawolves are team to be reckoned with in the playoffs. DU took UAA a little too lightly a few weeks ago at Magness and let the Seawolves claim an OT victory to salvage a split, so I don’t see DU taking UAA lightly again on the ice. Revenge will be on the menu for Denver, That said, DU’s fans will take UAA lightly and not bother to show up this weekend, as school is on spring break, and the fans here traditionally do not turn out in big numbers for first round WCHA playoff games against the lower half of WCHA teams. I expect attendance in the quiet 4,000 each night at best this weekend, so home ice won’t help DU too much beyond the altitude. The Pioneers are 3-1-2 in their last six games and come in averaging 3.0 gpg without top playmaker Tyler Bozak, who has missed the last 17 games with a knee injury. DU was averaging 3.8 gpg with Bozak in the lineup for its first 18 games. DU continues to receive strong goaltending from Marc Cheverie and features 13 players with 10 or more points and 10 with 21 or more points. DU is led by captain J.P. Testwuide (3-10--13), and alternate captains Rhett Rakhshani and Tyler Ruegsegger. Rakhshani, Ruegsegger (38-42--80) and Patrick Mullen (19-59--78) are DU’s top current career scoring leaders. Testwuide leads the team in penalties (37) and penalty minutes (104). Cheverie, who has started all 35 games in net, has stopped 23 or more shots in 27 games with three shutouts. Kyle Ostrow has 4-2--6 in his last five games, while Luke Salazar has 1-3--4 in his last four games. Goaltender Marc Cheverie is 3-1-1 with a 1.38 GAA and .958 Sv% in his last five games. The Pioneers have scored at least one power-play goal in their last eight games. DU is 13-for-44 (29.5%) with the man-advantage during that span, including a season-high four PPGs at Minnesota Duluth on Feb. 6. DU is 27-for-28 (96.4%) on the penalty kill in its last four games. Yet all in all, DU is a team where the last few minutes can make a huge difference. In recent weeks, the Pioneers have played either very well in the final minutes (Beating UW and tying CC) or horrible in the waning seconds, losing to UAA, SCSU and letting CC tie them at the end. I am sure DU will be trying to focus harder in the dying minutes of games, as fatigue is a factor at this time of year. As we saw last time UAA was here, the Seawolves have a decent skating NHL sized lineup and will try to play physical hockey against Denver to offset the lack of skill on the lower end of their depth chart. The Pioneers will need to leverage their team speed advantage and try to outskate UAA in transition in order to be effective. The Pioneers have more offensive depth than UAA does, but UAA is clicking on all cylinders now, and DU will need to do a better job of keeping UAA to the outside, where their size advantage will be less dangerous. DU won’t overlook UAA, but I don’t see a DU sweep, either. UAA is good, but Denver is slightly better and playing at home. Denver in three games. DU wins game one 3-1, UAA wins game 2, 2-1 and Denver wins game three, 2-0. UAA 1 on Saturday.